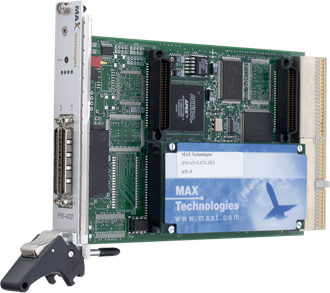 The PXI-400 carrier board is a high performance, modular multi-protocol PXI solution to your databus test and simulation requirements, supporting one or two MAX Technologies mezzanine I/O modules. It is powered by a 200MHz RISC processor and 16 MB of shared memory, permitting it to buffer and process communication with the host computer. 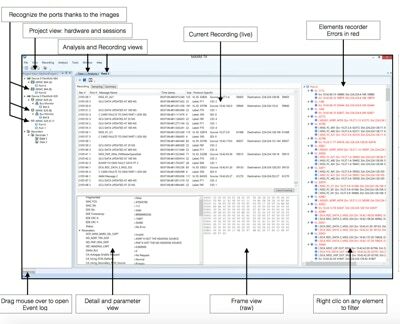 The on-board firmware allows scheduling of transmit messages, bridging between protocols, complex label filtering, and triggering of recordings. Received messages are time-tagged with 32-bit or 64-bit microsecond precision, without requiring real-time intervention from the host system. Furthermore, multiple carrier boards can be time-synchronized resulting in unmatched precision in critical real-time applications. The PXI-400 is complemented by MAX Technologies’ mezzanine I/O modules available for ARINC 429/561/568/629/708/717, ASYNC RS-232/422/485, CSDB, ASCB, HDLC/SDLC, MIL-STD-1553, Pulse/Frequency generator, Analog and Discrete I/O and more. Moreover, multiple protocols can be implemented and run simultaneously on a single PXI-400 carrier board and all the data transferred is time-synchronized, even between multiple protocols and multiple boards.